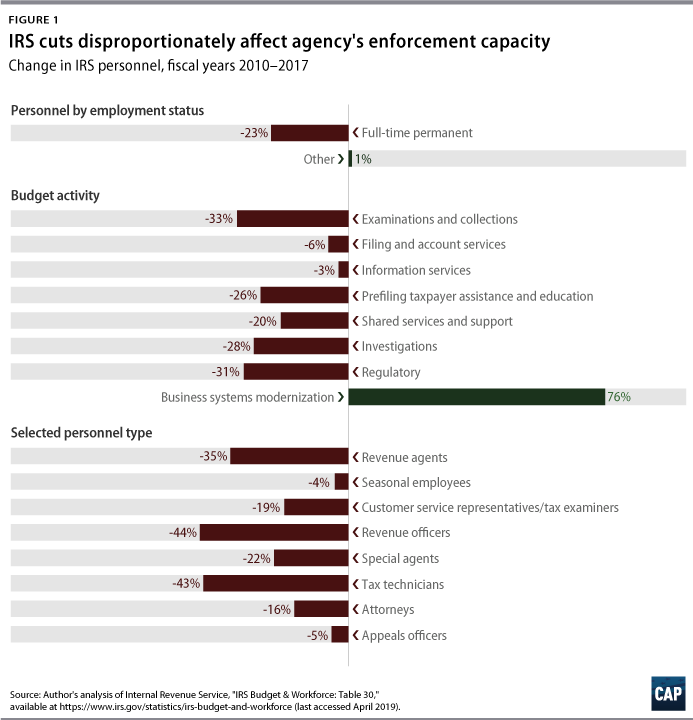 From FY 2010 to FY 2017, IRS personnel declined by 23 percent. The fact that more than three-fourths of these personnel cuts were to employees responsible for enforcement activities should raise concern about how declines in funding from Congress have forced the agency to skimp on important functions. In FY 2017, the IRS examined only 0.54 percent of returns. Comparatively, in both FY 2010 and FY 2011, this percentage was 0.93 percent—indicating a decrease in audits of approximately 42 percent in the six years between FY 2011 and FY 2017. The total additional tax revenue from examinations over fiscal years 2010–2017 shows an overall decline in additional tax paid after examination, regardless of return type. 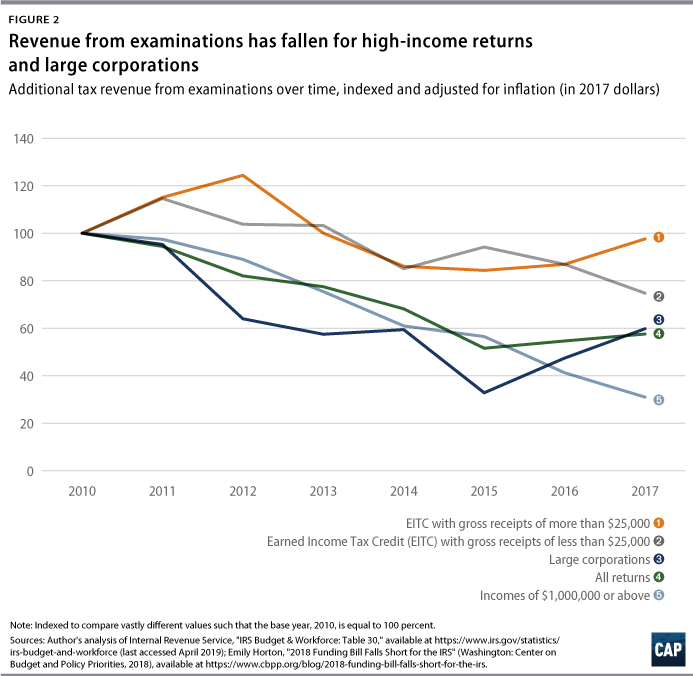 After indexing for large differences in scale, there were steep declines in revenue from audits of returns with incomes of more than $1 million. Until FY 2017, large corporations actually had the largest deteriorations in additional tax after audit, despite an upward trend in corporate profits since FY 2010. However, enforcement revenue collected from earned income tax credit (EITC) claimants stayed relatively close to their FY 2010 values. The agency has only managed to avoid mass layoffs due to the steady drain of retirement-age workers. In 2013, an estimated 66 percent of revenue agents and officers were eligible for retirement. At a finance committee hearing on April 10, IRS Commissioner Charles P. Rettig stated that approximately 45 percent of IRS personnel would be eligible to retire over the next two years and that less than 3 percent of the workforce is under the age of 30. There was also a hiring freeze from 2011 to 2018, which greatly contributed to the generation gap at the agency. This is particularly concerning because of the lead time needed to replace these workers. According to Janet Holtzblatt, a senior fellow at the Tax Policy Center, it takes approximately three years for IRS staff to reach their full potential. This training period is especially important for IRS employees who take on the ultrawealthy, since the legal and financial resources available to these individuals and businesses make them difficult to audit. In order to start hiring and training younger new staff, updating antiquated computer systems, and bringing examination revenues back to their previous heights, Congress should raise appropriations funding for the IRS back to FY 2010 levels. Promisingly, both the two-year budget framework put forward by House Democrats and the budget proposed by the Trump administration would provide room for additional IRS funding through a special cap adjustment. This adjustment would mean that certain levels of IRS funding are not counted toward the caps on FY 2020 and FY 2021 appropriations that would otherwise apply. This makes sense because additional resources dedicated to tax enforcement reduce budget deficits by bringing in additional revenue. For example, the Congressional Budget Office estimates that, over the next decade, an additional $20 billion in IRS funding for enforcement initiatives would bring in $55 billion in additional revenue. And that estimate does not count the potentially more significant indirect effects of enforcement on tax compliance—in short, the extent to which better and more certain enforcement reduces cheating. 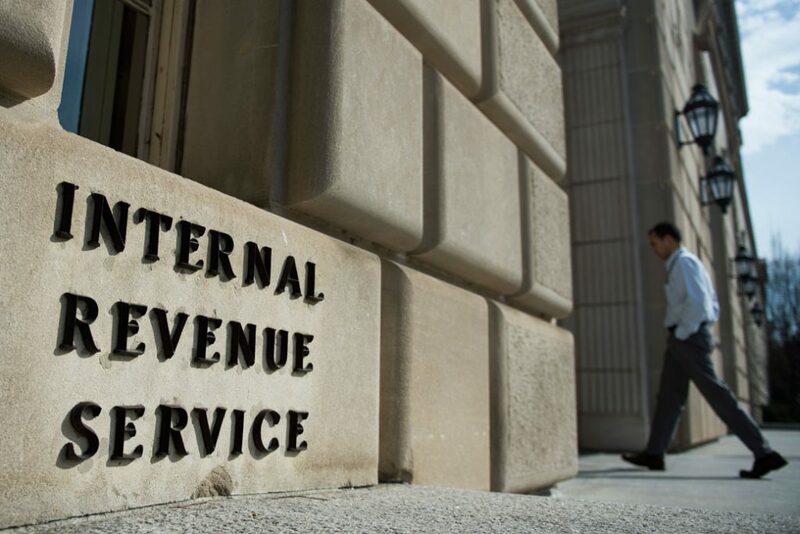 The IRS must receive the federal funds necessary to effectively perform its job. The ability to collect and enforce taxes is a core policy that distinguishes developed countries from the rest. Studies have shown that democracies with poor tax enforcement structures have higher levels of corruption. For this and the other reasons detailed in this analysis, it is simply illogical to starve the IRS of its funding. A significant increase in appropriations for FY 2020 would be an important first step in what must be a multiyear effort to substantially improve tax enforcement and compliance. Sara Estep is a research assistant for Economic Policy at the Center for American Progress.